Traditionally Māori learnt cooperatively in groups, with rituals marking steps in the process. Those with the appropriate lineage sometimes attended whare wānanga (houses of learning). 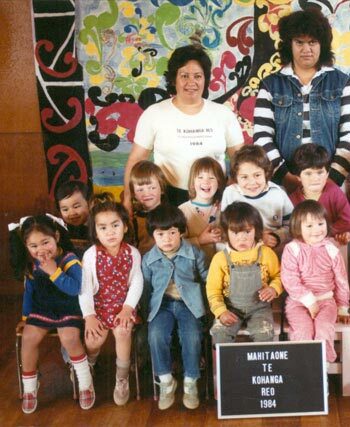 In the 2000s wānanga had been revived to provide tertiary education, while kōhanga reo (preschools) and kura kaupapa Māori (schools) used the Māori language to educate younger learners. In traditional society, tohunga carried out rituals to prepare children for their roles in the tribe. Children learnt in groups, and rituals marked each step in the process. Whare wānanga (houses of learning) were only open to those of proper chiefly lineage. Missionary Thomas Kendall set up New Zealand’s first European-style school for Māori in the Bay of Islands in 1816. By the 1830s there were many mission schools. From 1847 the government supported mission schools to provide religious instruction, industrial training and English-language classes. From 1858 students were expected to board at the schools. In 1867 a national system of native primary schools was set up. From 1894 schooling was compulsory for Māori. Children were taught English and were sometimes punished for speaking Māori. Schools suffered from inadequate resources and untrained teachers, and there was an emphasis on manual and domestic skills. Secondary education became free in the 1930s, but few Māori had access to it. From 1941 secondary departments were added to some native schools. In 1969 the remaining Māori schools came under the control of regional education boards. The earliest church-run boarding schools were set up in the early 19th century, originally as mission schools. Te Aute College in Hawke’s Bay led the way in providing academic education for Māori, and some of its students went on to university. However, the government encouraged church schools to focus more on practical skills. As Māori moved to the cities from the 1940s, more attended local high schools. By the early 2000s a number of the church schools had closed. wānanga – Māori tertiary institutions. All were first set up by Māori, and later received government support and funding. In 2011 Te Wānanga o Aotearoa was New Zealand’s second-largest tertiary education provider. The growth in Māori-language education has sometimes led to shortages in resources and trained teachers fluent in Māori. Many reports have noted Māori underachievement in the education system. However, Māori in Māori-language schools appear to do better than those in other schools.